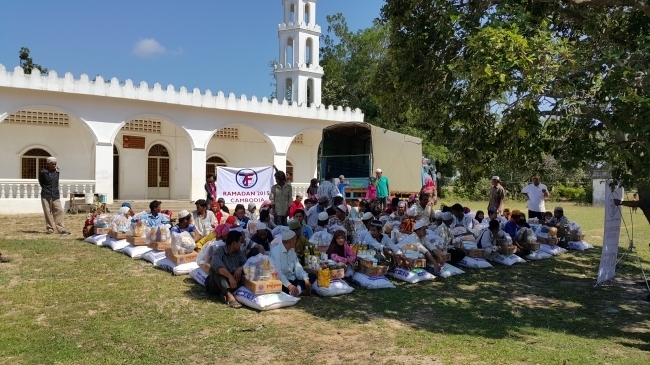 Zakat Foundation of America (ZF) is helping our Sisters and Brothers in Cambodia by a recent collaboration with Cambodian Muslim-American groups to expand ZF humanitarian efforts within Cambodia. The joint project was featured in the latest publication of Islamic Horizons as well as being covered by the Cambodian Muslim Media Center (CMMS). ZF distributed food packages to 150 Cham Muslim families in the Kampong Chhnang and Pursat provinces where most people make a living off fishing or farming. The past year saw little rainfall in the paddy fields which led to insufficient crop production. The aid packages included sacks of rice among many other food supplies. According to one of the village chiefs, this was one of the largest food distributions the villages have seen. Overall, ZF was able to reach out to 723 brothers and sisters in need. Many of those who benefited were widows or people with disabilities. See the video of our ZF representatives on the ground in Cambodia here. CMMS President Sles Nazy expressed his sincere gratitude to ZF and other organizations that donated their resources. Although several NGO’s from the Middle East or Turkey have been active in Cambodia, Nazy hopes to see more outreach from American NGOs such as ZF.